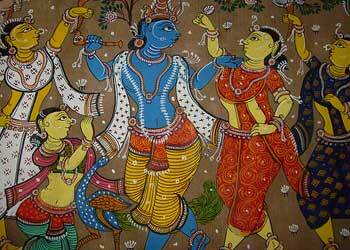 Pattachitra is an age old traditional painting of Odisha, India. Paintings depict Hindu mythology and are inspired by Lord Jagannath. It is one of the oldest art form of Odisha. 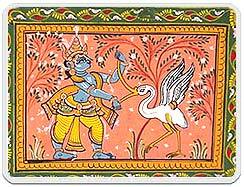 Pattachitra is a Sanskrit name, patta -cloth and chitra- painting. 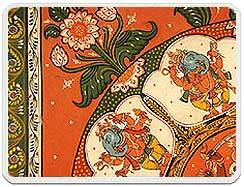 Thus its a painting on silk or cotton cloth filled with rich color that portrays Hindu mythology. Style: The style is mix of folk and traditional elements. Mainly depicting stories of Lord Jagannath. Paintings have very intricate designs and lines are bold and sharp. Background on which figures are painted is always filled with floral motifs. Mainly red, yellow, black & white colors are used for filling in. Borders mainly in red is an essential part of every painting. Colors used are all natural. Process: Painting is done on canvas. Canvas is prepared by applying glue (dried and powdered Tamarind seeds and chalk powder) then it is dried in sun. Canvas is then rubbed with the khaddar stone to make it smooth and then rubbed with chikna stone to make it shine. Then the motif or figure is drawn on canvas directly with the brush by chitrakars who have mastered this art. Then natural colors obtained from vegetables and various stones are filled in. Brushes used are very fine and made of mouse hairs. Final coat of lacquer is applied to protect it from weather and to make it last long. Really nice and informative write up Disha. pattachitra is such a beautiful process, amazing! I just love the complexity of this and the fact that natural substances are used. don't you just love India and our heritage! the diversity in folk and regional art is mind boggling! you might enjoy our blog.Aalayam! Nice & very informative blog!